The Attack Democrat--Nothing Conservative Here: Conservative economist’s calculations demonstrate that stimulus worked quite well. Conservative economist’s calculations demonstrate that stimulus worked quite well. 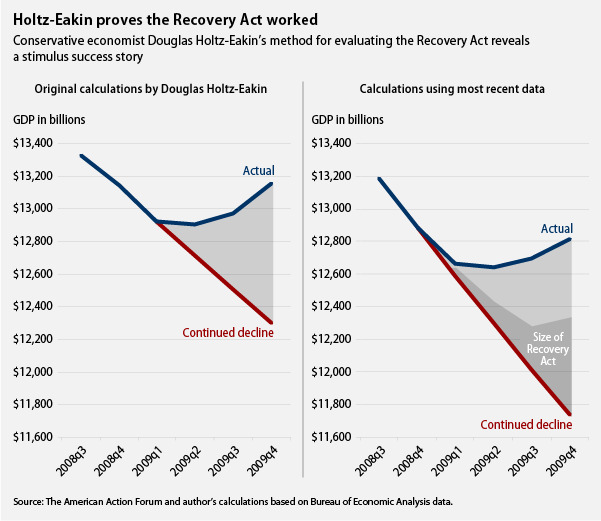 Michael Linden at the Center for American Progress uses the methodology of conservative economist Douglas Holtz-Eakin to assess the impact of the stimulus (the American Recovery and Reinvestment Act of 2009) on growing the economy and creating millions of jobs. Much of last summer, Holtz-Eakin used a graph which he said showed that the American Recovery and Reinvestment Act was utterly ineffective at spurring economic growth. That graph is on the right below. Holtz-Eakin agrued that it proved that the stimulus money was wasted because it cost $260 billion and the difference in what the GDP would have been without the stimulus if trends had continued was $268 billion, in other words little difference. Linden updated the graph with more recently available numbers that show that the economy was much sicker than originally thought. Linden’s graph is on the right. Result, the stimulus “produced about $2.10 in economy activity for every $1.00 in spending or tax cuts. That’s a pretty good multiplier.” Damn right. I’ll take two for one any day. Imagine what the economy might be like today if the Republicans had not blocked any additional stimulus. Want to know why unemployment is still high? The Republicans prevented us from continuing to do what was working. The economy was very sick. The Obama administration and Democrats prescribed just the right medicine. The economy started getting better. Then, the Republicans stepped in and took the medicine away. The economy hasn’t completely died but it remains a lot sicker than it would have been. Of course, as I have said before many times, a sick economy is just what the Republicans doctors have ordered. Now the Republicans are insisting on feeding the economy a poison pill of reduced spending in the name of deficit reduction. They aren’t satisfied with a weak economy. They want to kill it. Unless Obama or someone stands up to them, they may just get their way.